Apr 29 Treat Your Feet By Getting SOAKED! Here at The Vibrant Beet, we love women entrepreneurs who gracefully dance (or walk or run) to the "beet" of their own drums, while sharing creations and ideas that make us feel good. We also love a great pair of shoes, especially if they are comfortable ones. Put the two together, and you have got some magic. After all, "Give a girl the right shoes, and she can conquer the world." ~ Marilyn Monroe. Enter Elena Corsano and Michelle Vale, co-founders of the newly launched Soak Slides: "Sandals For Women In The Know & On The Go!" Read on to learn about the two beauties (with brains) behind the line, why it is so important to treat your feet with the utmost respect and what makes these sandals a must for your summer wardrobe! Elena Corsano is a highly successful marketing professional with over 15 years of experience. Her name topped the mastheads of international magazines such as Elle and Town & Country. Her extensive knowledge brings an insider’s perspective and a unique understanding of products and brand development. She has a special ability to shape trends by combining artistic sensibility and a genuine connection with consumer perceptions. An accessories industry veteran, designer Michelle Vale, has received extensive press, design awards and various accolades for her eponymous and innovative handbag collection. In spring 2014, Vale completed producing her first documentary “Make It In America: Empowering Global Fashion.” She is thrilled about her next venture, SOAK and is passionate about bringing the make it in America fashion message to the masses. The Vibrant Beet: What do you love most about fashion, designing your own products and owning your own business? Elena: I can’t remember a time when I wasn’t thinking about fashion. I feel as though I’ve always thought about it, and, perhaps because of this, I can’t pinpoint when I started thinking about my own products, but I can put dates on when I first started working in fashion and when I first created my beauty products and the same applies to Soak. It possibly existed from the moment I met Michelle, but the formation of the company is much more recent. Michelle: I started designing during my teen years. I would always be shopping around for something I created in my head. It was extremely frustrating. This lead me to design both my prom dress and wedding gown. Being able to have a career that I am both passionate about and can earn an income from is a dream come true. TVB: What is the hardest thing about owning your own business? SOAK: Work/life balance. It is very hard to completely shut down and stop working in order to pay attention to our familes. We are always thinking of ways to improve our products and dreaming up the next iterations of them. The future stretches out forever, so it’s really difficult to switch gears and become present even to just watch a movie. That being said, we understand the importance of balancing work/family and make it a priority to designate family time and try to support each other in making this effort. We are both grateful for having the support of our incredible families. TVB: How and why was the idea for Soak born? SOAK: Like so many things do, Soak evolved from personal perspective. We needed this shoe in our life and then we had our Eureka Moment when it dawned upon us that all women probably did too. Comfortable, but chic shoes for women to wear and feel confident in. Whether you live in city, suburb or country all women need comfortable shoes to get around in. From exercise, to school drop off, to work and then after work to drinks, Soak Slides are literally the shoe you cannot live without. It was designed to be sophisticated enough to wear with a pencil skirt, blouse and blazer, yet perfect to wear to Yoga. We did the research and we’re thrilled to have received the validation from other women that Soak indeed is a true need! TVB: Is there more than one style of Soak? SOAK: For now, there is one slide design in several variations; solid color, solid metallic, solid color block and metallic color block, with additional variations currently in the works. Additionally, there are several other styles being considered for future seasons including a platform version… stay tuned! TVB: What makes your sandals so unique and so comfortable? 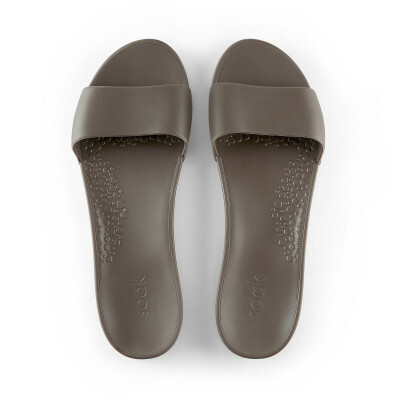 SOAK: Our sandals are both sleek and innovative…simply put, we knew from the beginning that style wasn’t enough. With the current offering of fashion flip-flops and slides available, a woman might find something attractive, but nothing exists that is both sophisticated and actually good for your feet too. So we weighed in with a celebrity podiatrist to help us solve the most typical pain points. Soak are designed with heel toe and arch support so during off hours from heels you now have an option that both looks good and offers support for your soles. TVB: What are your sandals made of and where do you source the materials for your sandals? 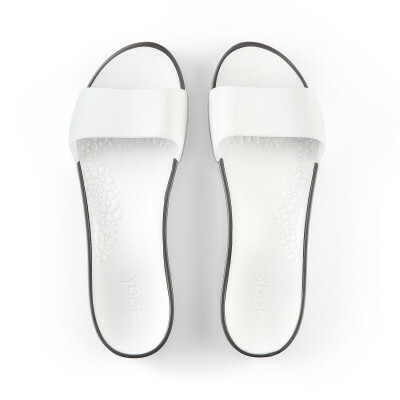 SOAK: Our sandals are BPA-free/non-phalate recyclable PVC. We source everything here in the USA and manufacture in Maine. Soak's are animal friendly. We understand that this may not be a big deal for everyone (and we certainly don’t judge) but we felt strongly about using both animal friendly and recyclable materials. We are dedicated to being a socially-conscious enterprise, focused on comfortable chic footwear and committed to providing much-needed jobs in the state of Maine, whose unemployment rate is currently at 5.6%. A lot of American brands are known for quality. We want help bring back the days where more products are not only made well, but manufactured here in the US too. Making a shoe that both looks good AND feels good too, comes down to how the shoe is made. Producing our Slides domestically means we can be much closer to our factories, giving us the ability to oversee the manufacturing process firsthand to ensure that we deliver a high-quality product our customers. TVB: Where do you envision Soak feet walking around? SOAK: Any place where the mercury tops 60 degrees Fahrenheit. It’s spring in NYC and we are already wearing them about town. We see them on city gals, in the countryside and, of course at the beach and pool. TVB: Why is it so important to wear comfortable shoes? SOAK: We start torturing our soles during our adolescent years and the damage slowly starts to develop from there on with 8-10 hours per day in heels through our 20’s and 30’s. And now, as mothers in our 40's, it’s become unbearable to wear heels for more than a couple hours at a time. And it isn’t just the podiatry effects, it’s just not possible to take the pain anymore. It makes a huge difference after a long day at the office to now have a comfortable option to slip into for your commute home or wherever your off to next. One that feels great and is verasatile enough to wear to wear out for cocktails and also be able to run around in on weekend shopping and errands. For young girls, Soak will become a preventative measure for the years ahead in offering them an option that allows them to not have to suffer through the pain as we did. For those of us who did not have this option, at least now there is a shoe option that we feel good and look chic in too. TVB: Who/what inspires you? Elena: The pioneers of Silicon Valley, Valentino Garavano, Isamu Noguchi and Warren Buffett. Passionate and fearless people from history and today. Michelle: Everyday women on the street who have an effortless chic and confident style about them. I am a total people watcher! TVB: Besides owning and running your own business, what do you do to stay active in NYC? Elena: I like Flywheel and Barre. It’s incredibly important to take the time to exercise as it really helps in clearing my thoughts. It’s not always easy to find the time but I try to get there 5 times a week. Michelle: I love boxing and tennis and do try my best to get to the gym several times a week. TVB: After a long day at work, where do you like to go to grab a healthy meal or a drink in NYC? Elena: Home. My fiancee’s an amazing cook/mixologist! Michelle: I do the most of the cooking in my world and love throwing dinner parties, but love a fun night out! The Greek in NYC offers fantastic and healthy fare. For drinks, The Bennett in Tribeca. TVB: Are there any other places in NYC where you go to unwind and find your “zen”? Elena: I meditate every day. Given my schedule I just can’t find the time to go somewhere to ‘chill’. If I could, I’d spend time in museums and galleries during the weekdays. Michelle: I love being active with my kids…playing soccer with my son and watching him play hockey. My daughter and I share a deep fashion bond and I am thrilled to say, I actually enjoy shopping with my 7 year old. You can now find Soak Slides in over 50 retail locations domestically and internationally ~ yay! They also can be purchased online at www.definitionofsoak.com. Follow the Soak journey on social media via: FACEBOOK, PINTEREST, INSTAGRAM & TWITTER. Cheers to putting your best foot forward with Soak Slides!